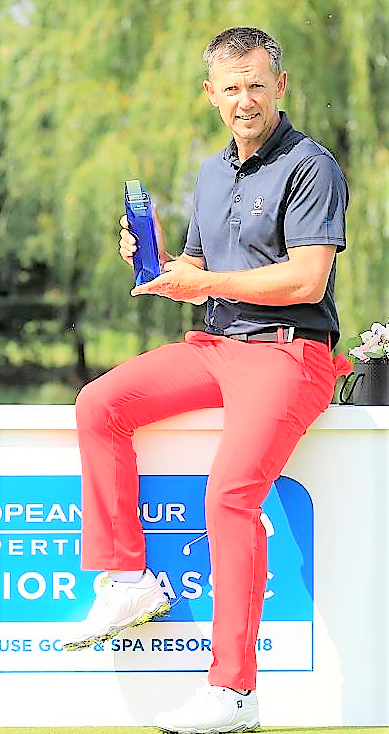 Magnus P Atlevi showed great character to win the European Tour Properties Senior Classic with a closing 67 to post a total of 14 under par 199 at Lighthouse Golf and Spa Resort, Bulgaria. The fight for the title proved to be a two-horse race, with Atlevi, (pictured by courtesy of Getty Images), just getting the better of Stephen Dodd who, following a double bogey on the 18th, finished on 11 under par, three shots behind the winner. Atlevi then bounced back as the final group headed towards home. Three successive birdies and a further gain at the 16th meant he approached the 18th with a one-shot lead. As it transpired, Dodd carded a double bogey at the final hole and Atlevi safely holed out for par and victory. The 53-year old Swede admitted to being overwhelmed after securing his victory and was delighted with how he bounced back after dropping shots around the turn. Argentinian Coceres signed for a seven under par 64, which would have been a course record if preferred lies had not been in operation.